October 26, 2017 — Top chef Mitsuharu Tsumura has announced that he is dropping out of this year’s Round Tables culinary festival in Israel, an event which invites prominent chefs from around the world to cook in Tel Aviv’s restaurants. His cancellation follows appeals by human rights activists and an open letter from international chefs and culinary authors. All urge withdrawal from this Israeli government-sponsored event because it serves as “culinary propaganda” to whitewash ongoing Israeli violations of Palestinian human rights. Tsumura is the second chef to drop out preceding the festival, following Irish chef JP McMahon, who cancelled last month after receiving similar appeals from activists in Ireland. Tsumura, the head chef at a Peruvian restaurant currently ranked as the eighth best restaurant in the world, was scheduled to cook in Tel Aviv between November 5 and 10. The Round Tables festival is not only sponsored by the Israeli government, but is in partnership with Dan Hotels, a large luxury Israeli hotel chain which has built a hotel on stolen Palestinian land in an illegal settlement in occupied East Jerusalem. The Israeli Ministry of Foreign Affairs is responsible for flying in the invited international chefs. In an email response to Peruvian activists, management at Tsumura’s restaurant confirmed that he would no longer be traveling to Tel Aviv to participate in the festival. The official Round Tables website is no longer selling tickets for meals with Chef Tsumura or Chef McMahon. We congratulate chef Mitsuharu Tsumura for heeding our appeals and cancelling his participation in the Round Tables propaganda festival in Israel. It is not the place of a Peruvian chef, or of any chef for that matter, to help mask Israel’s brutal oppression of Palestinians. This win is a boost to the Boycott, Divestment and Sanctions (BDS) movement in Peru and our efforts to end Latin American complicity in ongoing Israeli violations of Palestinian human rights. 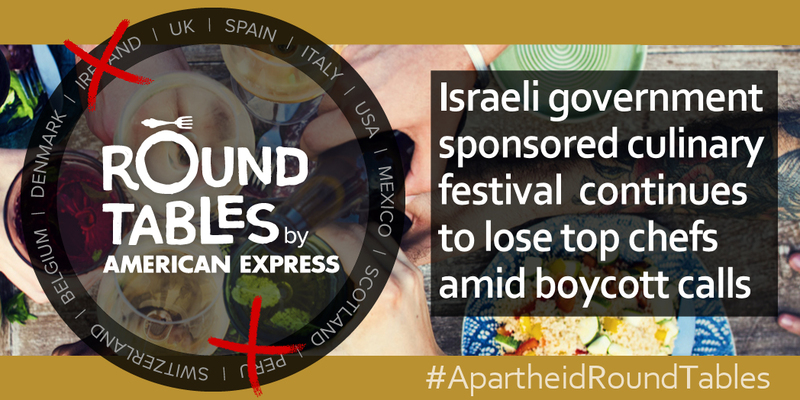 The #ApartheidRoundTables campaign to expose the festival’s sponsorship by the Israeli government and use as propaganda to whitewash Israeli crimes has enabled us to build strong connections with international chefs. We’ve raised awareness in this community of culinary artists about Israeli policies that deny Palestinians their very right to food. The Round Tables festival is taking place while the Israeli military and Israeli settlers illegally living on stolen Palestinian land attack Palestinians during their annual olive harvest. We are pleased that two chefs have cancelled this year and urge those still taking part to follow suit or risk permanently tainting the reputation of their restaurants with Israel’s regime of military occupation and apartheid. Last year, a top chef from Bolivia withdrew her support from the Round Tables festival after human rights activists exposed its Israeli government ties. The Round Tables festival begins this Sunday, October 29 and lasts until November 17.